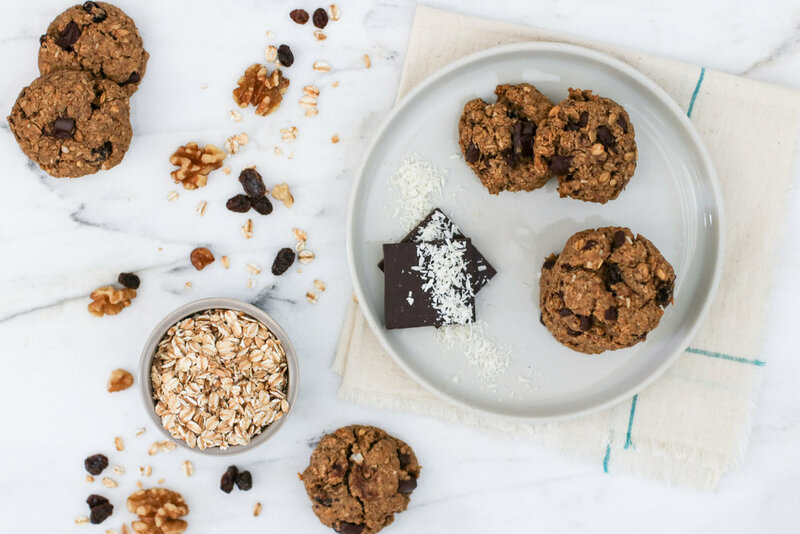 Chocolate Walnut Oatmeal Raisin Cookies — Erin Parekh | Live Well, Simply. AND the most amazing oatmeal raisin cookie I’d ever had. Studded with dark chocolate and an almost overpowering amount of cinnamon, but it was just enough. So, for a little Valentine’s Day treat to myself (and to you of course too), I decided these were what I wanted to recreate — only with my own healthy spin on them. My version uses ground toasted walnuts as the base along with oatmeal and sorghum flour. Then they’re loaded up with cinnamon, raisins, super dark chocolate, and shredded coconut. I know some people aren’t raisin fans, so feel free to either omit them entirely or add a little extra chocolate (never a bad thing). You could also use mulberries. Place walnuts on baking tray and toast for 10-minutes until just golden, being careful not to burn them! Remove walnuts from oven and let cook for 5-minutes before adding to food processor and pulsing until finely ground, but not turned into a flour. Add in 1 cup oats, almond flour, coconut sugar, baking soda, cinnamon, and sea salt. Pulse again until just combined and the oats have broken down slightly, 30 seconds or so. In a large mixing bowl, whisk together maple syrup, almond milk, melted coconut oil, and vanilla extract. Dump in dry ingredients from the food processor and mix well until everything is well incorporated. 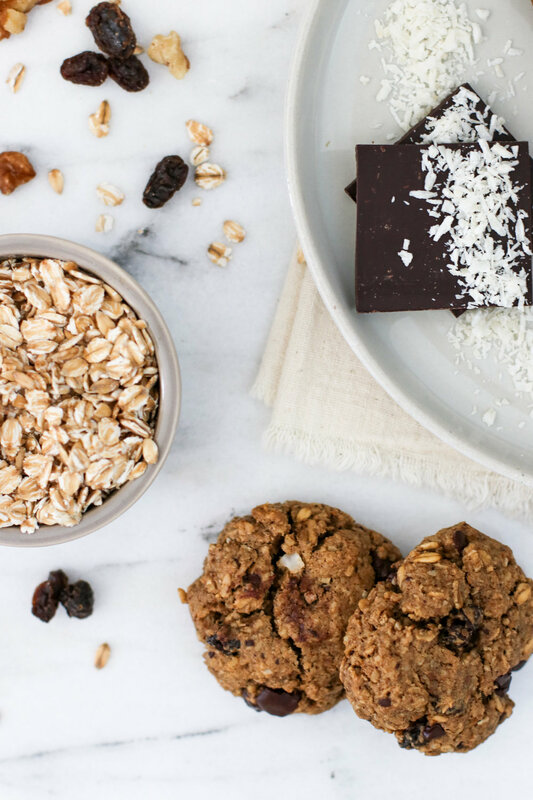 Stir in remaining 1 cup oats, then gently fold in the raisins, dark chocolate, and shredded coconut. Scoop out roughly 2 tablespoons of dough and roll it into a ball, then gently flatten with your finger tips and place on lined baking sheets. Bake cookies for 10 minutes, remove from oven and let sit for 2-3 minutes before transferring to cooling rack. Store cookies in an airtight container at room temperature for 3-4 days or freeze for up to one month.